Last week, I had the privilege to do a talk at the Winter Cities Shake-Up. The conference brought together innovative thinkers from all over the world to discuss ways in which we can make the most out of winter. I thoroughly enjoyed the conference and felt that it validated a lot of my feelings around city building in a winter city. One of my favourite moments at the conference was chairing a session in which Gil Penalosa spoke. He’s such an amazing advocate for healthy cities. His 8-80 approach proposes that cities should be designed in a way that is accommodating and liveable for both an 8 year old and 80 year old. If you haven’t seen his work, I’d highly encourage you to visit his website. My talk focused on winter, mental health and urban design. While I am not an urban planner by training, I believe that occupational therapists are positioned to contribute meaningfully to the conversation on how we build our cities. OTs have a comprehensive and holistic understanding of health in that we acknowledge the influence the environment can have on well-being. Whereas the traditional medical model sees disability and illness as existing in the person, OTs see illness as a dynamic experience that is influenced by the environments in which we live. The reason I’ve developed such a strong interest in urban design stems from an experience I had working with a client (who I’ll call Philip) who was referred to me because he was experiencing severe depression. Through my conversations with Philip, I learned that he was profoundly lonely. My first thought was to find opportunities for him to connect with others. Using my OT skills I did some community mapping with him. Community mapping involves analyzing and assessing a neighbourhood for the resources and opportunities it has to foster natural connections with others. Philip is on income assistance and the only place he could afford to live was in a group home in the suburbs on the fringe of the city. Through the community mapping process, I soon realized that his neighbourhood had next to no places to meet others. No coffee shops. No libraries. No recreation centres. The only “public space” he had access to was a small park that was a few blocks from his house, which in the winter was barren and uninhabited. Philip was extremely lonely and couldn’t even really do anything about it. He didn’t own a car. He found public transit to be an arduous and lengthy process. He usually got around by walking and his neighbourhood was brutally “unwalkable”. Through working with Philip, I was witnessing firsthand how urban design was impacting mental health, and since then have had a keen interest in exploring the relationship between design and health outcomes. My talk at the winter cities was a collection of thoughts around how we can build our cities to support wellness and mental health, particularly in the winters. Winter can be a difficult time for people for a variety of reasons, and it is important to recognize the added challenges it brings (as well as the opportunities it can provide as well). I thought I’d share some of my thoughts in my next few posts. I’ll be writing about my #lightbrightyeg project in the coming weeks, but in the meantime check out my recent interview on CBC Spark. Winter can often keep people indoors and function to further isolate those who already experience significant social exclusion. Social exclusion has been shown to impact both mental and physical health. 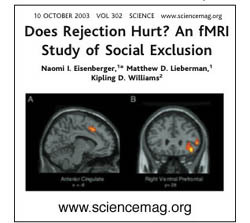 One study has shown that being excluded activates the same circuits in our brains that physical pain does. Social isolation literally hurts. 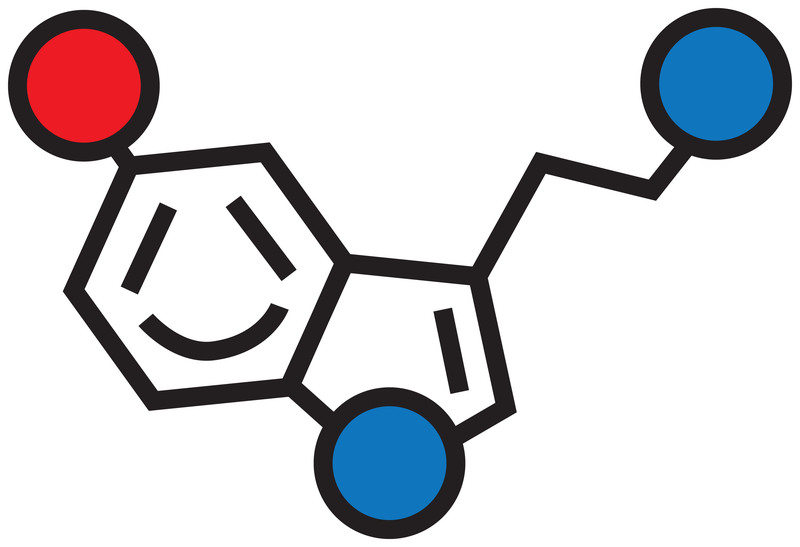 The other fascinating piece around social connection is that it has been shown to release oxytocin which then triggers the release of serotonin. Interestingly, Philip was on an anti-depressant which was designed to increase the amount of serotonin in his brain… It seems that we are trying to medicate loneliness when we should actually be “prescribing” friendships. Humans evolved living in groups and communal settings. In today’s society, we’ve drifted so far away from that model of living. Public spaces can function as convenors and meeting places. Places where we can connect with each other and get our necessary doses of feel good chemicals, like serotonin. The issue with winter is that it often drives people indoors, away from others. I think that great winter design would make public spaces easier to access in the winter. I live a block away from Cafe Bicyclette, where they have fire pits on their patio. On a wintry day you can sit outside, enjoy a coffee, and meet some neighbours. 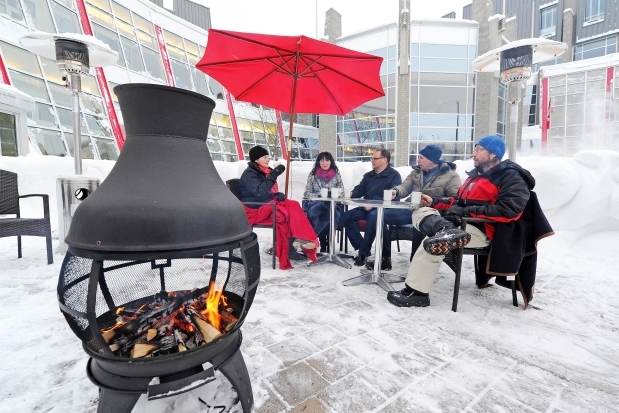 It’s a fantastic example of a winter city public space. 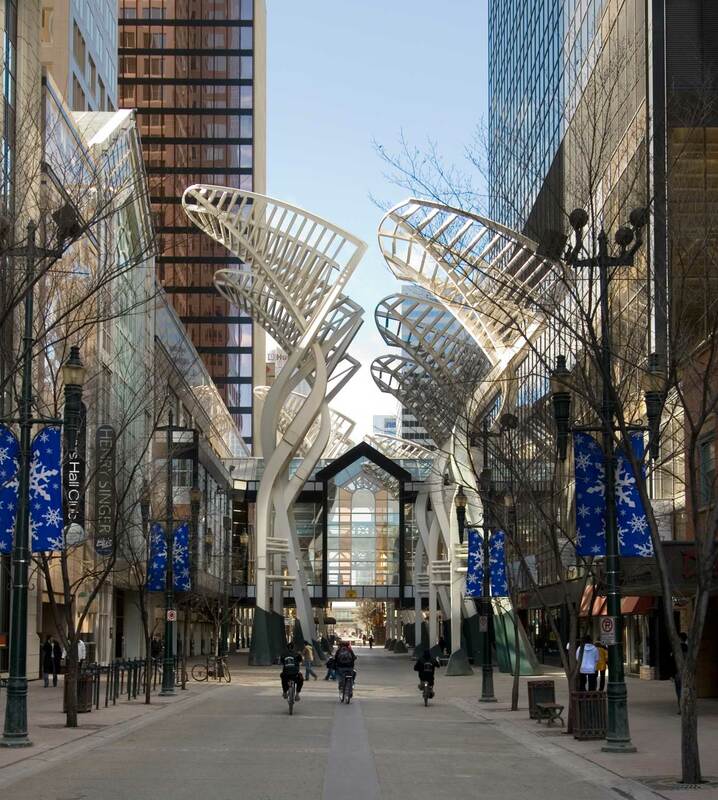 If you’ve ever taken a walk on Stephen Ave in Calgary, you’ve probably seen the “trees”. Apparently they were designed to reduce wind gusts, which would reduce windchill and get more people outside connecting with each other. Brilliant. My dream is that one day we have outdoor hot tubs for public use in Edmonton’s river valley (if you can help me do this please let me know!!). Research has shown that immersion in warm water releases oxytocin as well. A conversation with someone in a hot tub and you’ve got yourself a good dose of feel good chemicals. I am hopeful that we are moving in a direction that where we begin to incorporate health into how we design our cities. From my perspective as a health care professional, I see huge potential for urban planning to address some of our most significant health challenges, particularly mental health. I know I’m not alone in thinking this way and would love to hear your thoughts on the topic. Feel free to comment below or tweet me! Prescribing friendships – that’s a powerful idea. Thanks, Robin.